Yellowstone National Park was established by Congress and signed into law by President Ulysses S. Grant on March 1, 1872. It was the world's first national park. This unique ecosystem is home to abundant wildlife, stunning geology, unique hydrothermal features, vast forests, deep canyons, and outstanding mountains. 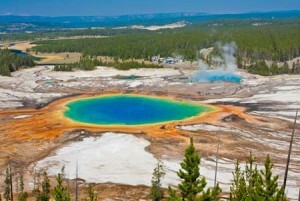 Spanning 3468 square miles, Yellowstone National Park is massive. If you're planning a trip to Yellowstone, there are some things you absolutely must see in Yellowstone. 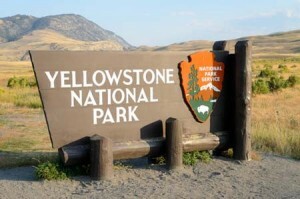 Everybody needs to visit Yellowstone National Park at least once in their life. It would be impossible to pack in everything in a single week or during one epic road trip because there is literally a lifetime of things to do and see in Yellowstone. This national park is filled with natural wonders that will make your jaw drop. Located in the Midway Geyser Basin along the Grand Loop at 7,270', the Grand Prismatic Spring is the largest hot springs in the United States and the third largest in the world. It is approximately 250 x 300 feet in size and measures up to 160 feet deep. It is approximately 160 degrees F. The rainbow like colors of the Grand Prismatic are what makes this a must see in Yellowstone National Park. The colors are created by a bacteria that lives in the mineral rich waters and the color is determined by the temperature of the water. Just south of the 45th Parallel Bridge near Mammoth Hot Springs, the Boiling River is a must see attraction in Yellowstone. The Boiling River is a location where hot springs enter the cooler waters of the Gardner River. These hot and cold waters mix making a perfect natural swimming hole where you can soak and swim. The Boiling River is a 1.25 mile round trip hike. Once there you can find clear waters that can reach up to 140 degrees, but more comfortable temperatures are easy to find. It's open all day and you'll need a swimsuit. 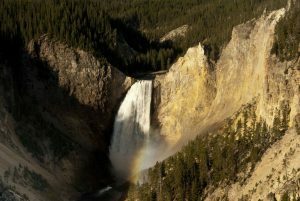 Located in the Canyon Village of YNP, the Grand Canyon of the Yellowstone is the first large canyon on the Yellowstone River - the longest undammed river in the United States. The Canyon runs 24 miles long, is 800 and 1200 feet deep, and spans .25 to .75 miles across. It's huge! Find the right spot and you can view Lower Falls as it plummets 308 feet or Upper Falls as it tumbles 109 feet. The canyon walls are marked in yellow, red, white, and pink colors making it a stunning location. Located between Tower Junction and the Northeast Entrance, the Lamar Valley has been described as the American Serengeti due to the abundance of wildlife that can be seen there. 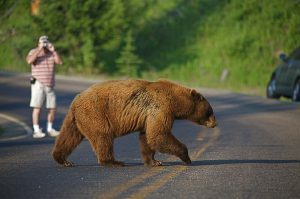 If you want to see wild animals, you need to visit this part of Yellowstone National Park. Bring a camera and a good pair of binoculars because you might catch site of buffalo, grizzly bears, black bears, wolves, antelope, bison, coyotes, eagles, elk, and other species. Stop by in the morning or late evening to increase your chances of spotting wild animals. No trip to Yellowstone would be complete without a visit to Old Faithful. Old Faithful is probably the most famous geyser in the world. 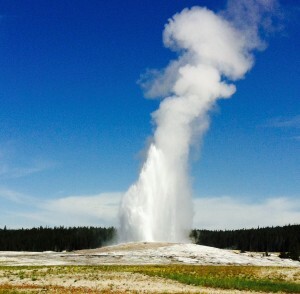 Named in 1870, Old Faithful is extremely predictable and erupts every 35 to 120 minutes. It can vary in height from 106 to 184 feet with eruptions lasting anywhere from 1.5 to 5 minutes. Water temperatures can reach 204 degrees and the steam can reach 350 degrees F. Definitely stop by and see Old Faithful do its thing. Yellowstone Lake is the largest body of water in Yellowstone National Park. It covers 136 square miles with 110 miles of shoreline. It located at 7732' above sea level. It's a stunning feature of the park that can't be missed. Make 2016 the year that you visit Big Sky and Yellowstone National Park. August 25, 2016 marks the 100th Birthday of the National Park Service. Will you celebrate the Centennial Anniversary in Yellowstone? We hope so. Visit Big Sky, Montana is located just north of Yellowstone National Park. It's the perfect base camp for all of your Yellowstone adventures. Book your trip today.